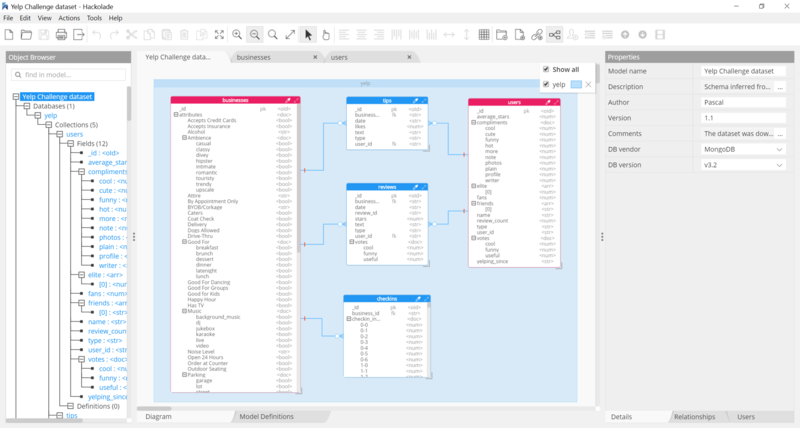 Hackolade is pioneering the field of data modeling for NoSQL and multi-model databases with its unique ability to represent deeply nested JSON objects in Entity Relationship diagrams. A well-designed, dynamic database schema is like a solid foundation for a house: if you want an application that will scale, perform well, and be able to support its evolution and growth, data modeling is a best practice that results in reduced development time, increased application quality, and lower execution risks across the enterprise. The application combines the graphical representation of collections and views in an ERD, with the graphical representation of the JSON Schema definition of each collection in a hierarchical tree view. The application is specifically designed around denormalization and the powerful polymorphic nature of JSON’s nested sub-objects and arrays. Hackolade dynamically generates MongoDB scripts as you build a data model in a forward-engineering approach. It also derives data models based on the reverse-engineering of existing MongoDB instances, so a data modeler or architect can enrich the model with descriptions, properties, and constraints. A powerful and flexible HTML documentation of the data model facilitates the dialog between analysts, designers, architects, developers, and DBAs. Hackolade facilitates higher data quality and data governance to smooth the onboarding of NoSQL technology in enterprise IT.